What is highway right of way (ROW)? Highway ROW involves an entire roadway, including travel lanes and shoulders, adjacent sidewalks, roadside corridors where utilities are located as well as rest areas. It may also consist of air or water access. Highway ROW is typically highway agency-owned or leased land that is most often used to create a clear zone within the roadway. A clear zone allows for a driver to stop safely or regain control of a vehicle that has left the roadway. Non-highway uses of Interstate ROW must not interfere with the safety of roadway operations and maintenance and are subject to airspace leasing requirements, if applicable. According to estimates using FHWA Highway Performance Monitoring System (HPMS) data, the amount of existing ROW that is a part of the National Highway System (NHS) is between 3,000-6,000 square miles (about the size of Connecticut); however, it is unknown whether this land is available for development. Three visioning workshops were held in the spring of 2011 to start a dialogue about possibilities for future uses of highway rights of way. The workshops were held in Long Beach, CA, Portland, OR and in Washington D.C. at the USDOT Headquarters, and included participants from a variety of transportation-related backgrounds, including planning, engineering, research and policy development. The goal of the visioning sessions was to brainstorm about possible uses of ROW and discuss barriers and opportunities for implementing these uses in a future context. Common themes shared across all three visioning sessions included the greening of ROW by using it as a location for energy harvesting and transmission for transit and other intermodal uses, and utilizing air rights to build recreational park space above transportation corridors. Most participants felt that alternate uses of ROW should be further explored in order to implement new technologies, meet growing system capacity needs, and for social and environmental enhancements. As stated by a participant, "green space does not generate a lot of money, but adds value for its environmental benefits." Many participants saw carbon sequestration projects, namely in rural areas, as an attractive policy goal for reducing the highway network's carbon footprint. Other environmental projects included using ROW for the capture and reuse of water, and in urban areas, greater and more strategic use of vegetation may help to mitigate the urban heat island effect. 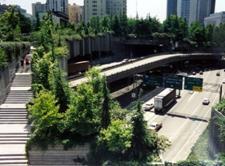 Using highway ROW to harvest energy from renewable sources was a shared by all visioning groups. Solar power was seen as particularly favorable as there are advances being made to increase energy production and to integrate solar material into pavement. Currently, most projects involving solar are being used to power infrastructure related to the highway facility, such as freeway illumination, traffic lights and signage. Participants looked favorably upon automating highway ROW to improve network safety and efficiency. Many participants thought that advancements in highway automation would emerge that would complement pre-existing uses of the ROW, such as inductive charging, which involves wireless energy transfer from a series of plates laid under the surface of designated lanes that would allow motorists to charge as they drive. A few participants also felt that automated technologies would advance the number of public/private partnership agreements. ROW was also discussed in the context of future transportation corridors. The possibility of converting underutilized corridors, such as abandoned rail lines, to general-use transportation corridors was also discussed. Since there may be a future demand for land in urban areas, more flexibility and strategic thinking will be required about how to use ROW for different purposes to best serve the public interest. Deck parks utilize air rights over highways to build a decking structure that allows for pedestrian traffic over the highway and provides areas of green and recreational space. Deck parks can alleviate negative externalities associated with highways such as noise and air pollution, and can become attractive areas for community gatherings and places that connect communities separated by the freeway through bike paths and walkways. Most deck parks are built over existing below-grade freeways; for example, the Capitol Reflecting Pool of Washington, D.C. is a deck park built over Interstate 395. In congested cities interwoven with freeways, a deck park can make a downtown area more livable and inviting for pedestrians. Many deck parks exist around the country. Currently, a 5.2 acre deck park over the Woodall Rodgers Freeway in Dallas is being built for a total project cost of $110 million, of which $17 million is from ARRA stimulus funds. These structures can be costly to build and require extensive planning for rerouting traffic during construction, but in cities where green space is limited the marginal benefit of creating even a small amount of green space for an urban area can be quite high. As many urban centers continue to grow, deck parks may continue to provide future connectivity between communities through the addition of walkable spaces. Automated transportation systems involve the application of control systems and information technologies to guide a vehicle that was once controlled manually. Automated highway systems could make driving easier and safer, improve travel time reliability and possibly reduce congestion and energy consumption. Automated transportation systems have been proposed in a number of ways and at varying degrees; certain models require lane segregation that involves active coordination between the vehicle and infrastructure, while others include reliance on only vehicle to vehicle communication using wireless technologies. Using existing highway ROW to run automated freight shuttles that carry small shipment sizes similar to trucks could provide similar efficiencies for transporting goods, such as low energy costs and labor costs. Currently, a prototype has been developed in Texas, designed by the Texas Transportation Institute (TTI), which is envisioned as a privately-owned and operated system, built through a public private partnership. As automated technologies continue to advance, it is very likely that future transportation system design will need to accommodate them. High voltage transmission lines placed within highway ROW is not a new concept. As the future demand for energy grows, ROW along highway corridors might be used to provide electrification for various modes of transportation, as well as to provide energy to the grid and surrounding communities. Modernizing and expanding the electricity transmission network is a key goal for creating a smart grid and expanding the use of renewable energy. Recent advancements in the design of transmission towers have decreased their size to the extent that placing lines within the ROW is often a feasible option. Although more costly, certain states have legislative initiatives that encourage the placement of high voltage transmission underground in high density areas. Virginia established a pilot program for underground transmission line placement, which included a project recently completed in Northern Virginia by the Dominion Power Company, where a section of the Pleasant View to Hamilton transmission line was placed beneath a bike path that followed Old Dominion trail. Intermodal uses of highway ROW include bus rapid transit, light rail and the possibility of fixed guide-way systems for moving freight. There are many examples of projects that have used highway ROW to provide transportation through other modes to help to reduce peak-period congestion and meet urban mobility goals. Buses on the shoulder (BOS) programs have been implemented in many cities across the country to increase the reliability of transit services and bypass congested urban freeways during peak periods. A futuristic outlook for moving freight might include the possibility of fixed guide-way systems that use magnetic levitation technology for the automated movement of cargo containers. The City of El Paso, Texas is currently conducting a feasibility study of a proposed freight shuttle that would cross the border of El Paso and the City of Juarez, Mexico using linear induction motors (maglev system). The freight shuttle would allow for the secure and efficient transport of goods and containers through border inspection facilities. Rest areas are public places of non-linear ROW that are most often located adjacent to a rural section of the Interstate or major state highway route. Most rest areas are maintained by a State DOT or toll authority and offer services for the long distance traveler. The availability of rest areas has been shown to increase the safety of the Interstate system; however, certain states have had to close rest areas due to budget shortfalls. The case has been made to rethink how to make every rest area safe and inviting through offering services such as truck electrification stations, Wi Fi, restaurants, and places to highlight renewable energy demonstration projects. At a rest area along I-70 in Colorado, solar flowers have been erected that harvest energy from the sun to power the rest area facilities. In the future, many rest areas could be powered by renewable energy and/or other types of energy harvesting technologies. Solar power collects energy from the sun to produce electricity. 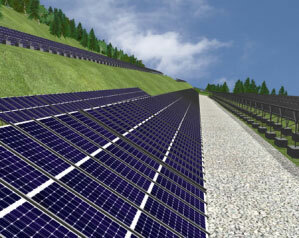 Solar panels can be placed within the ROW or solar materials can be integrated into the pavement. The Oregon State DOT has installed solar panels along a stretch of highway ROW at the interchange of I-5/I-205. 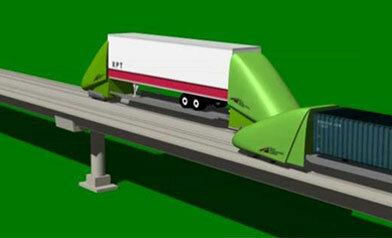 Wind Turbine technology has several variations that could be used within the highway ROW. This technology draws energy from the wind and/or air generated from rapidly moving vehicles through the principle of aerodynamics. Street lights with a vertical wind turbine and solar panel (hybrid) have been used in test sites across the country to power traffic lights and for street lighting. The University of Nebraska-Lincoln is currently researching this technology at test sites at intersections. Kinetic Plate technology involves energy that is harvested from vehicles traveling over ground-level plates that move hydraulic pipes to power a generator. The technology is has been used in places where cars are traveling at low speeds, such as a parking lot, toll plaza or rest area. Kinetic plate technology was first used in Gloucester, UK, where a plate in a super market parking lot powered the store's checkout. Piezoelectric Power involves discs or plates installed under the highway pavement that generate electricity by capturing the pressure and vibration of traveling vehicles. Currently, there are a number of demonstration projects in this country and abroad that are testing the feasibility of using this type of technology to produce energy. In the U.S., California is using transportation funds to place cutting-edge piezoelectric technology under two roads. As there have been many examples around the country of innovative uses of highway ROW, it is expected that future advancements in technologies and deployment of demonstration and full-scale projects would continue to grow, given available resources. From a policy perspective, continuing research is needed to better inform and support policies to help advance these initiatives in the field. 1) Develop and support national and statewide policy initiatives that encourage renewable energy projects and longitudinal accommodation of electric power transmission line placement within the ROW. 2) Develop and support national and statewide policy initiatives that encourage the placement of broadband and wireless technologies within the ROW. 3) Encourage states to use federal Transportation Enhancement funds to implement innovative ROW projects and improvements, and expand the scope of eligibility of these projects to receive federal transportation funding. 4) Explore issues related to commercialization restrictions on rest areas. Many State DOTs have closed rest areas because of financial constraints. This affects the safety of drivers who are fatigued, especially those who work in the trucking industry. 5) Explore the need and utility of states maintaining a ROW database that includes dimensions and ownership of all ROW and information on cost structures. 6) Initiate and support demonstration projects within the highway ROW that will help to accelerate the deployment of innovative technologies which will enhance the transportation system and/or benefit the public interest. 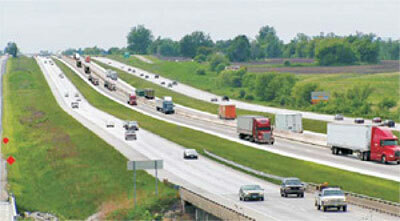 Further research should include projects related to automated highway systems. States have their own rules and regulations set forth to guide ROW project management. Among their top concerns are the safety of the roadway, liability and access when considering ROW uses. New and underutilized corridors may be designed to use ROW to offer alternative modes of transportation, and to be flexible in terms of using ROW for different purposes at different times. In rural areas, the linearity of the ROW and its location in proximity to power generation and distribution facilities may make these areas attractive for large-scale renewable energy projects, electric transmission line placement and pipelines. We would like to thank the FHWA review team for their input on this project, including the Office of Planning-Realty, Office of Operations, Office of Safety, the DC Division Office and the Turner Fairbank Highway Research Center.